Sober Look: Too-big-to-fail Q&A. Get the facts. Too-big-to-fail Q&A. Get the facts. The debate around "too big to fail" of the US banking system is often infused with political rhetoric and media hype. Let's go through some Q&A on the subject and discuss the facts. Q: Did large banks take disproportionate amounts of real-estate related risk vs. smaller banks prior to the crisis? A: No. That's a myth. Smaller banks were much more exposed to real estate (see discussion). Q: Which "too big to fail" banks were directly bailed out by the US federal authorities during the 2008 crisis? A: While hundreds of banks were forced to take TARP funds, only Citigroup received an explicit bailout to keep it afloat (one exception is Bank of America who received significant incremental assistance largely to support the acquisition of failed Merrill Lynch). Note that Bear Stearns, Merrill Lynch, Lehman, AIG, GM/GMAC, Chrysler, Fannie and Freddie were not banks and would not be subject to any "too big to fail" legislation. Neither was GE Capital and other corporations who relied on commercial paper funding and requited the Fed's support to keep them afloat. Wachovia may have become the second such large bank if it wasn't purchased by Wells. Failed foreign banks like UBS and RBS also would not be subject to any US too-big-to-fail laws. Q: Why did Citi fail in 2008? A: Citi ran into trouble because of a massive off-balance-sheet portfolio the firm funded with commercial paper. In late 2007, when the commercial paper market dried up, Citi was forced to take these assets onto its balance sheet. The bank was not sufficiently capitalized to absorb the losses resulting from these assets being written down. Q: What were the assets Citi was "warehousing" off-balance-sheet? A: A great deal of that portfolio were the "AAA" and other senior tranches of CDOs that Citi often helped originate (including mortgage related assets). Rating agencies were instrumental in helping banks like Citi structure these assets and keep them off balance sheet in CP conduits. Q: Why did Citi (as well as many other banks) hold so much off-balance sheet? A: Because they received a significantly more favorable capital treatment by doing so (the so-called "regulatory capital arbitrage" - see discussion from 2009). Q: Did Citi break any state or federal laws by doing what it did? A: No. All of this was perfectly legal and federal authorities were aware of these structures. Q: Did derivatives positions play a major role in Citi's failure? Were other large US banks at risk of failure due to derivatives positions? A: No. That's a myth. The bulk of structured credit positions (tranches) that brought down Citi were not derivatives (just to be clear, CDOs are not derivatives). Q: What has been done since 2008 to make sure the Citi situation doesn't happen again? The US regulators now have the ability to take over and manage an orderly unwind of any large US chartered bank. Banks are required to create a "living will" to guide the regulators in the unwind process. The goal is to force losses on creditors in an orderly fashion without significant disruptions to the financial system and without utilizing taxpayer money. Large banking institutions are now required to have more punitive capital ratios than smaller banks. Capital loopholes related to off-balance-sheet positions have been closed. Stress testing conducted by the Fed takes into account on- and off-balance sheet assets, forcing banks to maintain sufficient capital to be able to take a hit. US banks more than doubled the weighted average tier-1 common equity ratio since the crisis (see attached). Q: Do large US banks have a funding advantage relative to small banks? and the Board of Governors (attached - h/t Colin Wiles ‏@forteology), "studies point to a significant decrease in any funding advantage that large U.S. financial institutions may have had in the past relative to smaller financial institutions and also relative to nonfinancial institutions at comparable ratings levels. Increased capital and liquidity, in addition to meeting the demands of many regulatory bodies, has largely, if not entirely, eroded any cost-of-funding advantage that large banks may have had." Q: What is the downside of breaking up banks like JPMorgan? A: Large US corporations need large banks to provide credit and capital markets access/services (Boeing is not going to use Queens County Savings Bank or a broker like Sandler O'Neill - great institutions, but way too small). Without large US banks, US companies will turn to foreign banks and will be at the mercy of those institutions' capital availability and regulatory frameworks. Foreign banks will also begin dominating US capital markets primary activities (bond issuance, IPOs, debt syndications, etc.) And in an event of a credit crisis foreign banks (who are to some extent controlled by foreign governments) will give priority to their domestic corporations, putting US firms at risk. 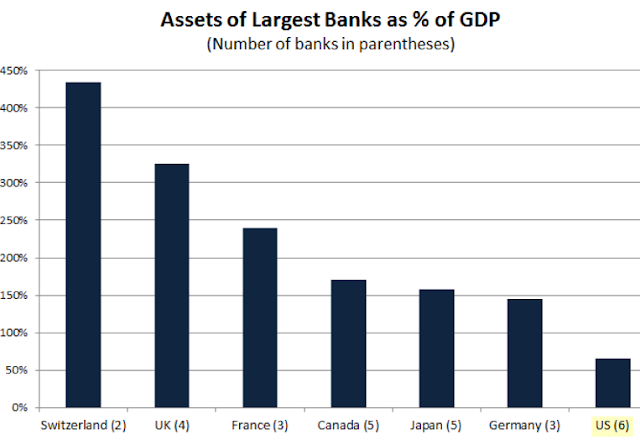 Q: How large are US largest banks relative to the US total economic output? How does it compare to other countries? So before jumping on the "too big to fail" bandwagon, get the facts.